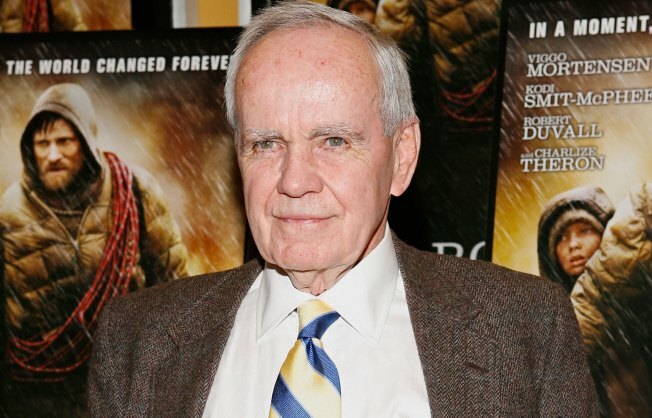 Cormac McCarthy attends the New York premiere of "'The Road' at Clearview Chelsea Cinemas. Looking for a well-used typewriter that has churned out some of the most provocative novels, screenplays and short stories of the past 50 years? Well, you're in luck. Christie's in Manhattan will auction the metal dinosaur Cormac McCarthy used while writing his novels, including "The Road," "All the Pretty Horses, and "No Country for Old Men." The 76-year-old author purchased the Olivetti for $50 in 1958. He's used it nonstop until this year. Christie's estimates it could sell for $15,000 to $20,000 on Friday. McCarthy concedes it has started to "show serious signs of wear." A friend found him a nearly identical replacement for about $11. The proceeds will benefit the nonprofit Santa Fe Institute in New Mexico, where McCarthy lives. A blue carrying case and the author's letter of authentication are included. McCarthy has won numerous awards for his fiction -- including a Pulitzer Prize, a National Book Award and the MacArthur Foundation's so-called genius grant. According to The New York Times, McCarthy is known for being taciturn, particularly about his writing. He came to realize that not only his working method but even his tools are puzzling to a younger generation. He remembers one summer when some graduate students were visiting. “I was in my office clacking away,” he said. “One student peered in and said: ‘Excuse me. What is that?’"
“I don’t have some method of working,” he said, adding that he often works on different projects simultaneously. A few years ago, when he was in Ireland, “I worked all day on four different projects,” he said. “I worked two hours on each. I got a lot done, but that’s not usual," he told the Times.